Last week, Warwick Isaacs claimed that it would cost $18 million to fix the Majestic. He didn’t provide any breakdown of his estimates, and still won’t provide the engineering reports, but I guess he thinks we should just believe him. $18 million is a lot of money. It is an inflated figure, designed to silence the heritage campaigners trying to have the Majestic saved. We have no way of knowing how realistic a figure it is – but I thought a comparison to another heritage theatre restoration might give some context. This is the Theatre Royal on Gloucester St. A lovely building which will be an asset to the city when it is reopened later this year. The total cost of this restoration project is around $30 million. Warwick Isaacs wants us to believe that restoring the Majestic will cost almost 2/3rds of what the restoration of the Theatre Royal will cost. Look, I’m no structural engineer, but I find it hard to believe that it the two could even be in the same ball park. The Theatre Royal project is almost a complete rebuild, based around the original facade, with much of the detail salvaged to be added back later. The Majestic may be badly damaged (Isaacs still won’t release the engineers reports, so we can’t asses that ourselves) but it has a steel frame. And unlike the Theatre Royal when that project started, it still has four walls and a roof. 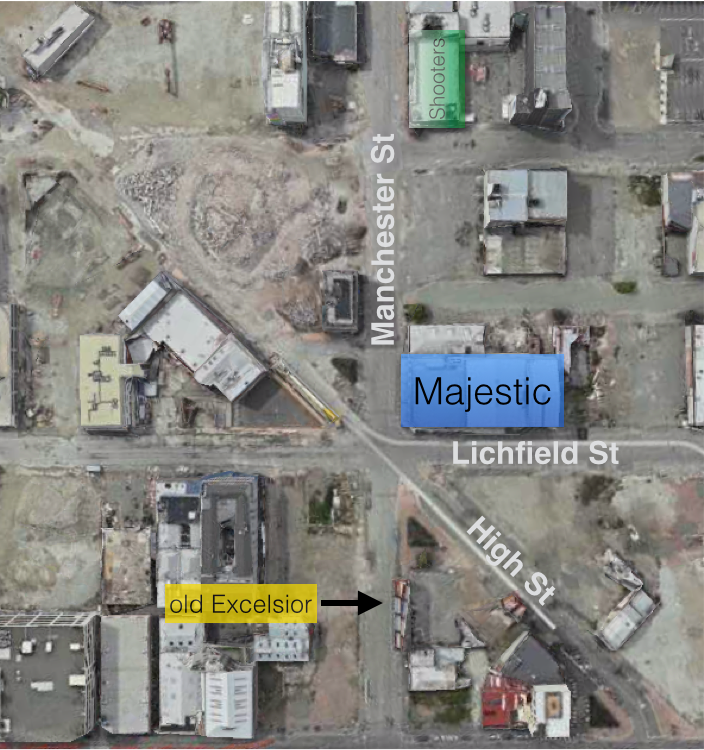 In a letter to the city council, Christchurch Central Development Unit (CCDU) director Warwick Isaacs said he had not made the decision to demolish the theatre lightly or in haste. He went onto strongly reject the council’s assertion the planned widening of Manchester St was the main driver for his decision. “Accessible City” is the CERA jargon for “transport plan”. So in this letter, from less than a month ago, he sited the transport plan as the first reason for knocking down the Majestic. The council then tried to respond to this, by ameliorating his concerns about transport. Isaacs then responded by claiming it wasn’t anything to do with transport. Unfortunately for him, the paper trail proves otherwise. Unable? I find it hard to believe that someone with almost unlimited powers to destroy, acquire and re-zone can’t pick up the phone and tell someone that he has contracted to stop. No, I think he is completely able to stop the demolition, but totally unwilling. I’ve covered the travesty that is the impending demolition of the Majestic on the blog a few times, but as I was walking past yesterday, realised that most people won’t be as familiar with the area as I am. The more you know about the area, the madder the decision becomes. I’ve made up a couple of maps, with three buildings highlighted on them: The Majestic, The Excelsior and Shooters. 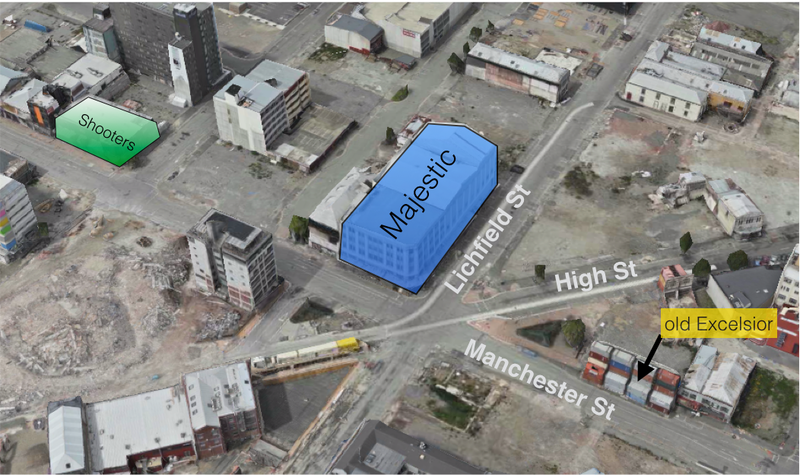 The Majestic is on the corner of Lichfield and Manchester St. I and others have written about the history of the building itself. It is currently in the process of being prepared for demolition, with the main reason given being that the land is required for the “accessible city” part of the CCDU Blueprint. In other words, they want to knock down the building to widen the road by 9 metres. You could argue that in a 21st century city, creating a 20 metre wide road actually makes a barrier that is less accessible to the pedestrians who are meant to be living in the frame on the east of Manchester St. You could argue that, and you’d be making a good argument, but it would be an argument that would be ignored by the powers that be. You could also argue that CERA seems to have an irrational grudge against the Majestic. For example, just 25 metres south of the Majestic is the facade of what was the Excelsior hotel. 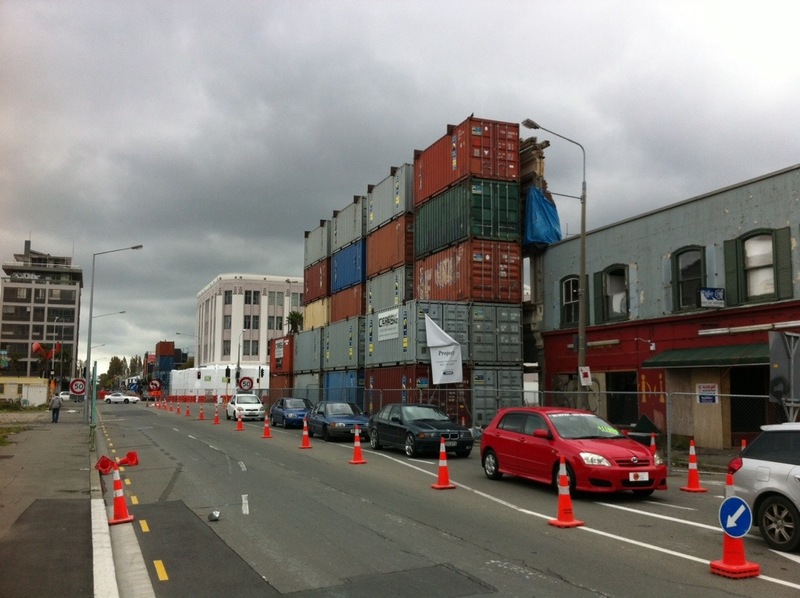 This building is now literally just a facade, propped up by stacks of shipping containers which stick right out into the eastern lane of Manchester St. As you can see from the photo, this is a current impedance to traffic on Manchester St, but CERA would rather concentrate their energy and wrecking ball on the Majestic, which poses a theoretical, future impedance to traffic. Don’t get me wrong, I’d like to see the Excelsior retained and rebuilt. It was a lovely old building, and the corner of High St in front of it was a pleasant, under-utilised part of town. However, I think it shows the lie of the CCDU’s actions; it is both a higher safety risk, and a bigger traffic problem than the Majestic, and yet there seems to be none of the hastiness to have its future resolved. Just one block further up the street, on the corner of Cashel and Manchester, is the lamentable Shooters bar. Unlike either the Majestic or the Excelsior, Shooters has very few, if any, redeeming features. 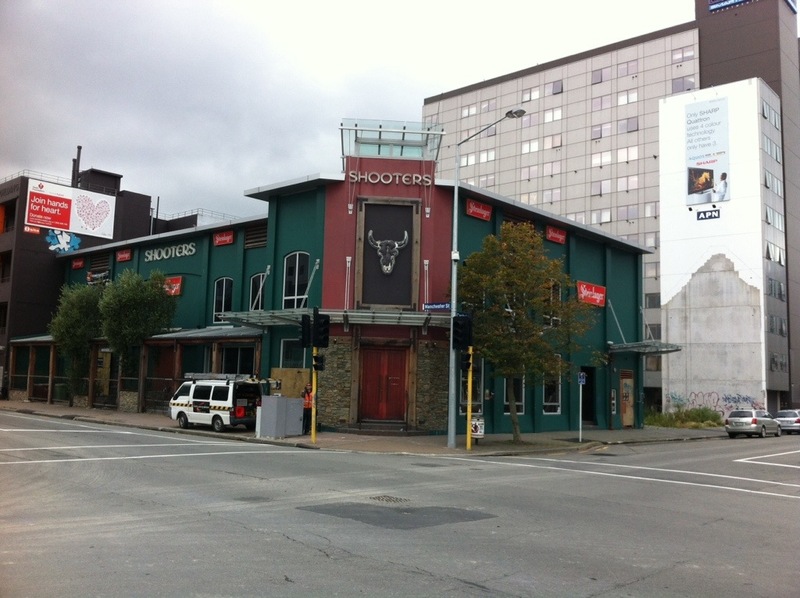 It is a fairly horrible tilt-slab building that used to be the home of one of Christchurch’s more notorious booze barns. I can’t imagine anyone will be chaining themselves to the fake cattle skull on the front of this building anytime soon. However, I have heard nothing from CERA regarding their intentions for this building. Perhaps they are planning to widen the road by 9m where the Majestic is, then run a chicane down past Shooters? Or maybe they have some sort of grudge against heritage buildings, and they are using whatever excuse is convenient at the time to pursue their agenda? At this point, it’s hard to argue that the Minister doesn’t have some sort of grudge against he he famously termed “old dungers”. 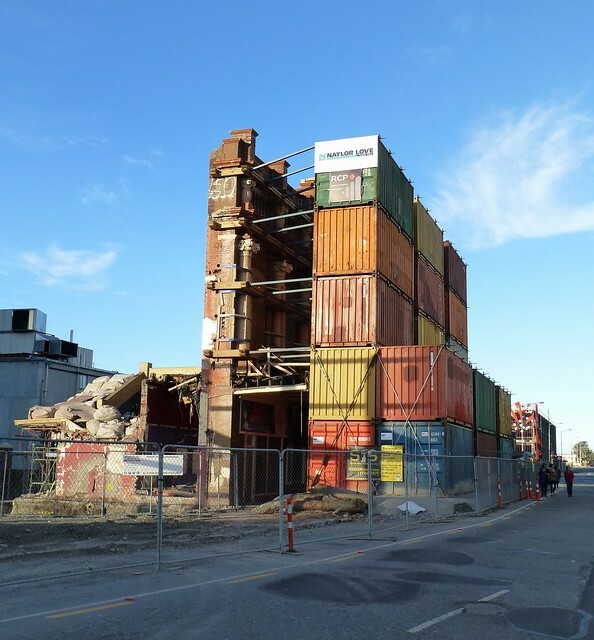 There is a comprehensive list of Christchurch’s heritage buildings here, of which over 235 have now been destroyed. CCDU acquired the building, and then CERA used the section 38 provision to request demolition, which means that there is no recourse through legal means to object to this process. CERA have also refused to release the engineering report for the building, despite saying they would when asked by the CCC in December. An OIA request has now been lodged to try and access this information. 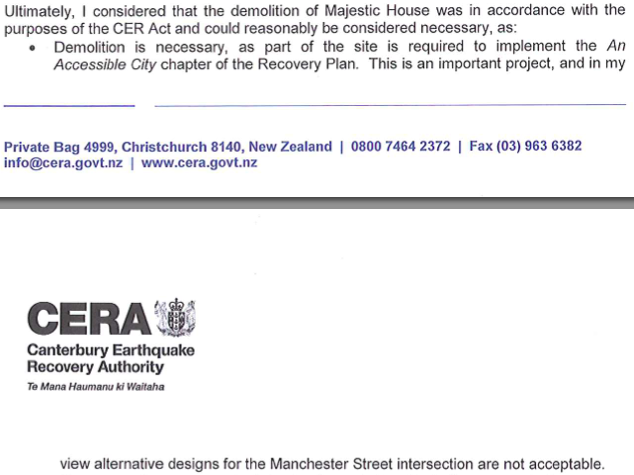 The reason given for the building’s destruction – which I’d argue is a spurious one – is that it is required to implement the “accessible city” part of the Blueprint plan, but at this rate, one has to wonder whether there will be any city left to access when Gerry and his mates are done. Last week, CERA made the decision to bowl over the historic Majestic Theatre. Given that we’ve lost so much heritage, it can sometimes be hard to muster any more outrage about the bulldozing of our cultural memory. However, this is a building worth fighting for, and a story that hasn’t really been done justice. In December last year, the CCDU acquired the Majestic. The CCC asked for an engineering report into the building, which CERA are still yet to supply. The Mayor, and certainly Councillor Yani Johanson, have strongly advocated for saving the building. 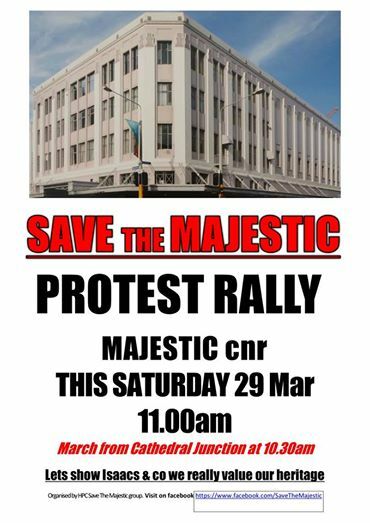 This week the Christchurch City Council vowed to help save the historic Majestic Theatre in Manchester St and Mayor Lianne Dalziel agreed the council should meet with Cera to emphasise the importance of retaining it. Historic Places Canterbury wanted the council to seek a moratorium on the demolition while a thorough engineering assessment was done. The demolition will be carried out under a section 38 notice, which has been used (and many would say, abused) by CERA since the CER Act was passed. using s38 in this way means the work does not require resource and building consents from council. This is able to be done because the Minister used the CER Act in July last year to amend the council’s annual plan, and is a process that has been used numerous times in the past year. Labour’s Heritage spokesperson put out a statement, but I fear it is too little, too late. With one hand, King Gerry is taking the building from the us, and with the other, he’s swinging his silver hammer. If you want to stop the destruction, come along to the protest, this Saturday at 11am.